Funding Successful. This project reached its goal before June 18, 2015. But we have to keep going – we’re not there yet! Sure, we’ve hit our initial target, but Rahena still needs to get the heart operation, and this means we need to hit $3,500 – a bit more than our initial target, so we need your help (we planned to run another campaign for this, stage 2 of Rahena’s needs, but if we can get these with this campaign, we will save valuable time). My name is Marti Dobson. I live in Brisbane, Australia. 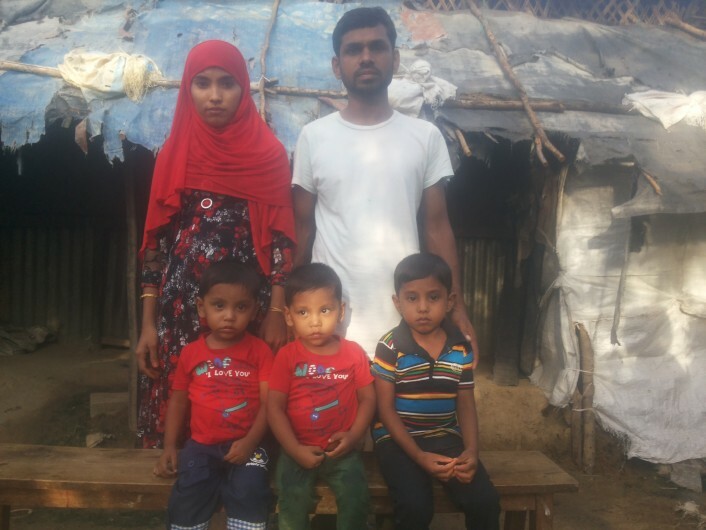 I have a Rohingya friend, a teacher, in Bangladesh (living in one of the ad hoc refugee camps in Cox’s Bazaar) whose wife, also a teacher, has a deteriorating heart condition and needs surgery ASAP. They have 3 young children, 2 year old twins and a 4 year old – all boys, all much loved by their peaceful parents. The surgery could cost around 2 lac taka (lac =100,000 taka, 2 lac taka = approximately AUD $3200 or USD $2550). Initially though, we only need to fund the long trip from Cox’s Bazaar to Dhaka, the capital of Bangladesh – a 9 hour bus trip or 40 minute flight (our preferred option for her safety and comfort), so Rahena’s current condition can be properly assessed and her best options for treatment determined (perhaps PTMC which is less invasive, perhaps valve replacement if PTMC is not possible). This initial trip and all the required medical appointments, tests and advice is expected to cost around 45,000 taka (approximately AUD $720 or USD $574 at today’s exchange rates). “I am Monir Ahmed. I am 28 years old. I am a vulnerable refugee. I am professionally a teacher, work in Rohingya refugee community in Bangladesh refugee camp. This is Rahena. She is 22 years old. She is a vulnerable refugee. We have been staying at Bangladesh for over 2 decades. She is a teacher. She teaches the children of her community. She is fond of educating people. She wants to give education to her children as well as her own community. Our parents fled from Myanmar escaping from inhuman torture by the government of Myanmar. We got married in camp life. I love my wife very much. She has been suffering from Rheumatic Heart Disease from 2011 to now. I have been taking care of her for her recovery of disease but I am tired. Now her disease is deteriorating day by day. I am very anxious for her disease suffering. She see her future gloomy. She thinks for her children very much that is children needs her loving, caring,educating. She fear the premature death. We are a family including with 5 members. We have 3 kids. The 1st son is 4 years old and 2nd sons are twins birth. They’re 2 years old. They are Mohammed Ibrahim, Mohammed Arif Elahi and Mohammed Dider Elahi. We are very peaceful family. I and my wife keep a lot of contributions for the Rohingya community. We especially like to help the disabled children. We are in very vulnerable and miserable situation. My wife is not getting proper treatment by the lack of money support. 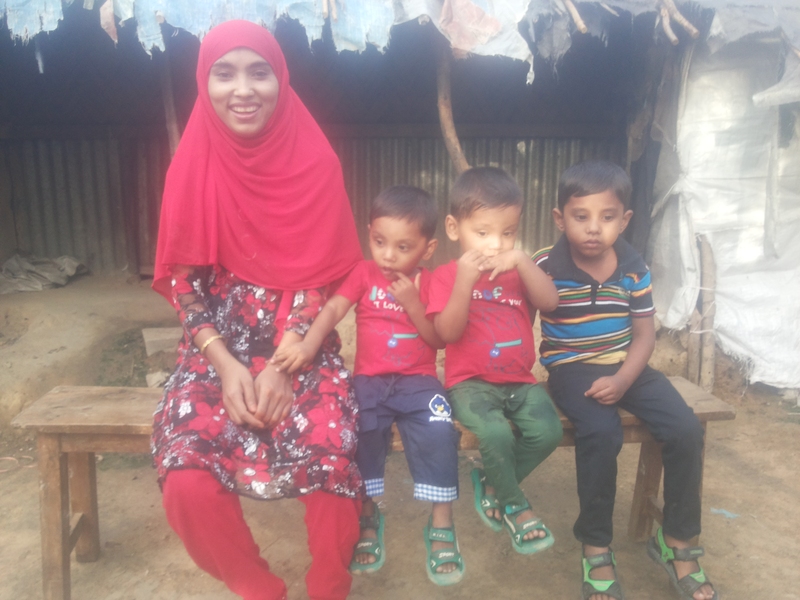 Refugees stuck in permanent limbo in Bangladeshi refugee camps deserve every single ray of sunshine, the happiness, health and security others take for granted. More importantly, Rahena’s children deserve to have their mother with them as they grow into young men with a desire to help make the world a better place. Monir, her loving husband, deserves to have the love of his life by his side, sharing all the joy they can find. FIRST TARGET: AUD $720 (45,000 taka) – to enable travel for Rahena and Monir from Cox’s Bazaar to Dhaka and initial exploratory medical expenses to establish the best option for treatment. SECOND TARGET: AUD $3,200 (to be confirmed) for either PTMC (inserting a valve through arteries and into the heart without the need for open heart surgery) or valve replacement, depending on medical advice as the the best alternative for Rahena. It would not take much to reach both targets. Not much at all. If I had the money I would do it all myself, but I simply don’t. If we raise more than what is required, we will organize medical treatment or other community assistance for the Rohingya living in abject poverty in Cox’s Bazaar. Please pledge whatever you can to make this happen. With the current news of Rohingya refugees stranded on the Andaman Sea in unseaworthy and inoperable boats due to the heartlessness of people smugglers and the even greater heartlessness of regional governments, I feel a compelling need to let Monir, Rahena, their boys, their students, their families and their friends and all Rohingya know one thing. Please note: iPledg is an all or nothing crowd funding platform. That means if we do not reach our target we get nothing and nothing is taken from your PayPal account or credit card. If you can not support this project financially you can still help by spreading the word using the share button and spreading the word to your friends. Thank You.